Executive Chef/General Manager Michael Brewer of Jackson in New Orleans shares his award-winning cocktail from the 2006 Tales of the Cocktail and his food-pairing recipe. Michael Brewer is a man of many talents; he is the Executive Chef and General Manager of the very hot restaurant Jackson, which opened in February 2006 in New Orleans, and a dynamic bartender, but this Mobile, Alabama native also has an Electrical Engineering degree. His background may be a bit unorthodox when it comes to cooking, but as his friend and Jackson owner, Thomas Corrington told him, Michael "can cook a little." I had a Tasting Dinner at Jackson in July 2006, and I readily concur with Thomas' quip. 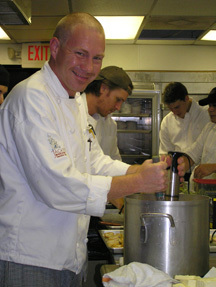 Michael Brewer definitely knows his way around the kitchen, and yes, the man can cook and make a fabulous cocktail! Michael Brewer shares his award-winning 2006 Tales of the Cocktail Best of Show Cocktail for a Baja Martini, which he paired with Baja Shrimp with Cheddar Cheese and Jalapeno Polenta. Muddle juices with cilantro and avocado in a shaker. Mix Bacardi and Malibu with juices and ice. Shake vigorously and strain in a chilled martini glass. Garnish with a slice of avocado. Slice tomato and onion in rings 1-inch thick. Cut bell pepper into quarters lengthwise and discard seeds. Place tomatoes, onions, green peppers, and pineapples on a hot grill for two minutes on each side or until nicely charred (vegetables should still be al dente). Remove from grill and chop roughly. Mix vegetables with lemon, lime, orange, and pineapple juices along with rum, honey, cilantro, and avocado, in a large mixing bowl to form salsa. Season with salt and pepper to taste. Bring water to a rolling boil and add corn meal. Stir until polenta is thick and creamy (about 2 minutes) and remove from heat. Add jalapenos and cheddar cheese and stir until completely incorporated. Season with salt and pepper to taste and keep hot. If polenta becomes too thick, stir in heavy cream to loosen. Marinate shrimp for 10 - 30 minutes in a mixture of olive oil, balsamic vinegar, and dried oregano, thyme, basil, and cilantro (Italian dressing works as well). Grill until done (about 2 - 3 minutes on each side). 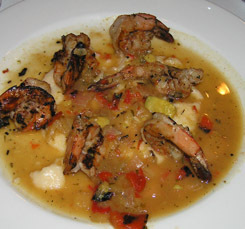 Spoon a generous portion of polenta on a plate and place 8 shrimp around the edges of the polenta. Spoon salsa over the polenta and serve. Makes 6 servings. You may also enjoy reading the article on Jackson in the Restaurants section. Read all of the Tales of the Cocktail and New Orleans articles in the Liquor Cabinet, Restaurants, Chefs' Recipes, Music Scene, and Events sections.